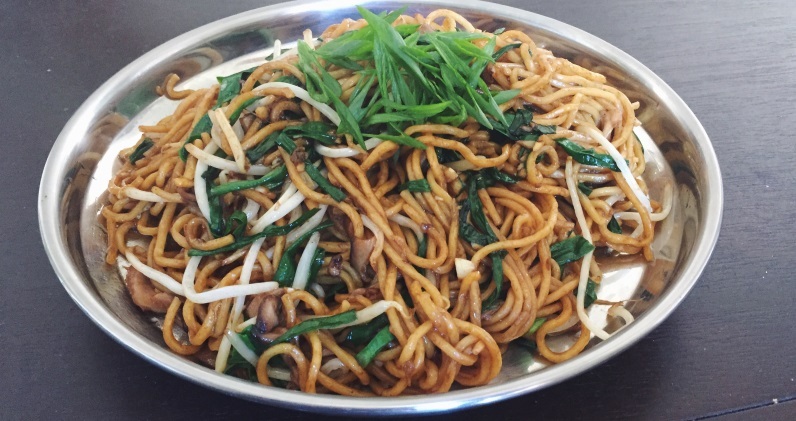 The Participant Observer Recipe of the Month is for Chinese New Year Chang Shou Mian (长寿面). This stir-fried noodle dish is easy to prepare, delicious and a great way to usher in the New Year! This year, the Chinese New Year/Lunar New Year* falls on February 5, ushering in the Year of the Pig. The Spring Festival, as it is also known, has become one of the largest celebrations around the world due to the significant Chinese populations throughout Asia, Europe and the Americas. There are a wide variety of regional customs that permeate the Spring Festival celebrations, however some common practices unite Chinese throughout the country and the world. Hanging red lanterns, taking part in lion dances as participants or observers, getting new clothes or a haircut, exchanging gifts of red envelopes and lighting fireworks are all typical celebrations of the New Year. While these all flavor the festivities surrounding the Zodiac shift, one mode of celebration plays a key symbolic and practical role in bringing Chinese families together: the reunion dinner. The reunion dinner is for many families the single most important meal of the year. It is expected that the entire family comes together for this one meal, regardless of how far apart relatives are from one another throughout the rest of the year. If a family member cannot make it to the New Year's Eve meal, then a place setting is left empty, symbolizing that the absentee is always welcome at the table. In addition to bringing families together, the dishes served are all imbued with symbols to start off the year right. Fish and dumplings symbolize prosperity, rice and noodles symbolize longevity and "red-cooked" dishes (typically a braised item that takes on a red hue, either naturally or via food dye) symbolize good fortune. All these items make an appearance on the table alongside fruits, sweets, soups and leafy greens, like Chinese broccoli (gai lan) or Chinese oil vegetable (yu choy). * Editor's note: Although Chinese New Year is often referred to as the "Lunar New Year", it is actually based on a lunisolar calculation. The start of Chinese New Year almost always falls on the 2nd new moon after the winter solstice, which means it usually takes place between January 21 and February 20. Bring a large pot of salted water to boil and add the fresh noodles, cooking until al dente and separated, about 1 minute. Drain the noodles and shock under cold running water to arrest cooking. Transfer them to a bowl and blend in 1 tablespoon of vegetable oil to coat. Heat a wok or skillet over high heat and add 1 tablespoon of oil. When the oil is beginning to smoke, add the mushrooms and stir-fry for 2 minutes, or until lightly browned and just tender. Add the chives to the pan, continuing to cook until slightly wilted, about 1 minute. Transfer the chive and mushroom mixture to a bowl and wipe out the pan, ensuring no residue remains. Heat 1 tablespoon of oil in the pan until lightly smoking and add the noodles. Stir-fry the noodles until hot and then add the mung beans, mushrooms, chives and minced garlic to the pan, tossing and stirring to combine. Add the two soy sauces, oyster sauce, wine and sesame oil to the pan, tossing with the noodles until the sauce thickens and coats them. Season with white pepper and serve immediately. Author's note: A couple of things about this recipe. The pound of noodles is a good amount if preparing a family-sized portion. For 1 serving, make a ¼ recipe. The noodles I used were Twin Marquis brand lo mein noodles, as I like their thickness and chew. I used Kim Lan (light and dark) soy sauce and premium Lee Kum Kee oyster sauce. If you're using different brands, I would adjust the amounts to balance saltiness and sweetness. Also, if making a full recipe, do so in batches. Cook off the vegetables together, but only stir-fry half of the noodles at a time to avoid crowding the pan and steaming the dish.